In the example above we're asking the customer to tell us what size they need in this item. (2) Type - this is the type of this option. Do you want a text or memo field for the customer to type in their info ( like name, initials for monograms..etc ) or do you want to list choices for them to choose from, in the form of a drop down menu, radio button or check box? 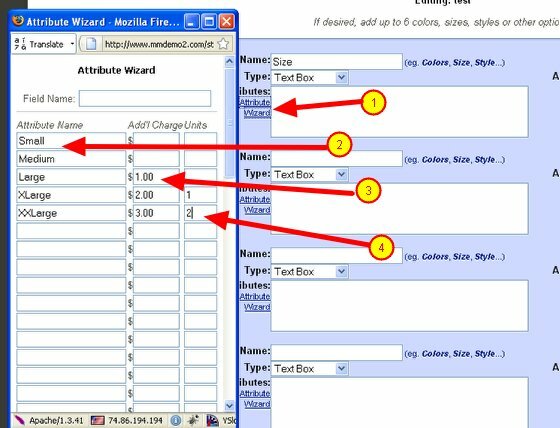 (3) Attribute wizard - this will help you format the choices you're going to give the customer if you're setting up a drop down, radio or check box. I'll explain more on that in the next step. (4) Will this option be active - Yes or No. You usually just leave this at Yes unless, for some reason, you don't want to it show in the product at this time but want to keep it for displaying later. The Yes choice will make it show on your product page for your customer to enter the info you need in order ship the correct item to them. Try not to use any special characters in your options ( apostrophes, colons..etc ) as this can cause problems. 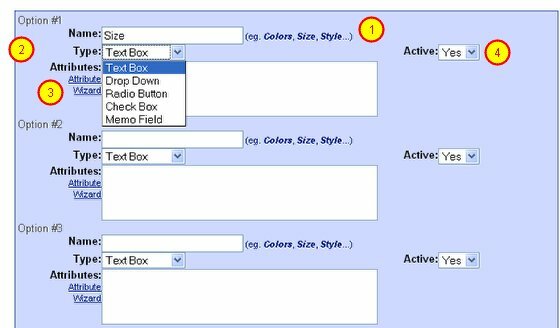 The above image shows that you can add up to 3 different options - examples: color, size, name to embroider - but if you need to gather more info from your customer you can add more options in the Catalog Setup Area. The attribute wizard helps you format the choices you will be offering to your customers to choose from. (1) First click on the "Attribute Wizard" link. A window will popup that will allow you to enter the options. Since you already have the option name filled in ( Size ) you don't need to worry about filling the field name in the Attribute Wizard window. (2) Enter your options, 1 ( one ) per line into the attribute wizard. (3) If there are any additional costs or fees for any option enter them in the "Add'l Charge" column. NOTE: This is in addition to the base price of the item, Example: A T-shirt has the price of $15.00 but the large is $16.00, XLarge is $17.00 and the XXLarge is $18.00. You'd put the $15.00 into the items regular price field ( see Add a new product/item - part 1 ) then in the attribute wizard you would only add the additional amount over the regular price ( $15) into the addt'l charge column. (4) Units - You would put the weight for the option, if any. Once you have entered all your options scroll down and click "Submit" don't worry about checking drop down or radio since you've already chosen what this will be. Look over your options to make sure all are right and click "Update Attributes"
Once you've added all the options needed for this item scroll down and click "Add Inventroy" or "Save"
Add Inventory - if you need to add inventory or related items, click Add Options to go to the next screen.